Experience mystery, magic, and merriment as Clark’s preferred one-stop leisure destination opens the much-anticipated Widus Spooky Carnival on October 31. 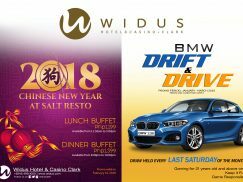 Reward the queen of your home with an extraordinarily unforgettable experience by spending some quality time with her and the whole family at Widus Hotel and Casino Clark. CLARK FREEPORT—A $1-billion luxury integrated resort will soon be completed beside the soon-to-open Marriott Clark Hotel on a 130,000-square-meter property in this free port. This developed after Friday’s groundbreaking of Widus Tower Four that will have a total floor area of 20,000 sqm in the $500-million luxury integrated resort.